ART LOVERUntil I began to have my work in galleries, or other venues, I rarely gave any thought whether or not I had a visual style. The truth is, I have interests in so many places (photographically) that I just can’t label it. I work with pinhole, digital, medium format and 35mm film, and iPhone cameras. I like landscape, sports, street, editorial and bird photography. And then there is post-processing whether in Photoshop, Lightroom, an iPhone app or a real wet darkroom. I love to “colorize” images, as well as inset an historic photo into the same modern-day viewpoint. On occasion I make a "Reconstructions," taking multiple photos from the same point and re-assembling them on the computer. And I would guess that before I hang it all up I’ll have done some wet plate work. I hope. As a beginner I learned from Diane Arbus, Henri Cartier-Bresson and Elliott Erwitt before discovering Robert Frank, Alexander Gardner, Edward Steichen, Ansel Adams, Robert Capa and so many more. Did they influence me? Of course. Aside from the last fifteen years or so, I feel my most productive period was in the 1970’s, when I worked as a newspaper staff photographer in Iowa, New Jersey and Mississippi. In between was a 20-year stint as a picture editor and director of photography at newspapers and I confined my photography to family photos, with an occasional exception for breaking (we called it “spot”) news or filling in when the staff was short. During the 1970’s I felt I had a style that was graphically strong, relied on juxtaposition, depth (layering) and humor. All in black and white. I agree, and it made me happy. I think we all take a lot of things for granted, health-wise. I’ll be the first to say I’ve been lucky so far. And as a photographer, any eye problem I take seriously. I have had small “floaters” in my eyes at times. Annoying, but they went away after a bit. So a couple of weekends ago, while driving, I saw some bright flashes in the outer corner of my left eye. Over the next half day my vision became cloudy with dark floaters and a smoky haze, I called my local eye doctor. He saw me on Monday and quickly set up an appointment with a specialist for Tuesday morning. Turns out that I had a detached and torn retina. The darkness I was seeing was from a blood vessel that had burst when the tear occurred. In photo terms, my CCD went bad. Photo by Sue SchaeferThe Dr. gave me my options, one of them being laser surgery, which seemed the least invasive. He said “good choice” and I asked when it would take place. He said, “now.” So off we went to another room. There was a lot of whirring, clicking and extremely bright flashes as he worked with his hand-held laser. I joked to the Doc that I should take a photo of this. His reply surprised me, “fine with me.” So I handed my iPhone to the nurse and she stepped back and made a photo. I am thankful to Dr. David G. Miller for the repair, and give credit to Sue Schaefer for taking the photo for me. At the follow-up appointment a week later I was told everything looked good, but hard to tell since my eye was still so cloudy. It’s kind of like having a grey sunglass lens over my left eye with the wrong prescription, with some floating blobs. I’m told it may take up to two months to clear. Focusing a camera is a challenge (thank you auto-focus), as is focusing in on detail on a computer screen, but I can still work. I’m told this is a “getting older” thing. And that had I waited, it could have been a lot worse. So if you have any sudden change in vision, don’t mess around, see a professional. 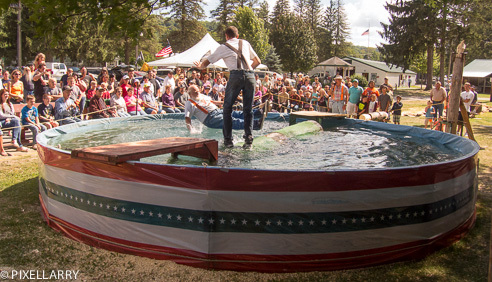 The annual Cattaraugus County Fair in my home County in Western New York has been going on since 1842. That's 171 years. My first memories are from the 1950's, when my Dad, a member of Lions, helped operate a doughnut tent, thanks to a Lion's member who owned a Spudnut shop. Great memories, especially on the final Saturday when they held the Midget car races, on dirt, on a 1/2-mile track intended for trotter horses. The pits were behind the Lions tent. So I go back when I can and I can honestly say, it hasn't changed much. Here are some impressions. The 4-H livestock barns are so much fun to walk through. I'm impressed by how family oriented it is. I don't remember there being equestrian events as a kid. Maybe they were always there and I just didn't take notice. In the background is the line-up of quality trailers for those that have big investments in their horses and other livestock. They stay the week, again, a family event. For the photographers out there, I know this is a cliche photo. I made a very similar one 40 years ago in Mississippi. But I made the photo because it is so universal, so classic. As I went through the domestic barn I was struck by how much our society has been affected by our "everyone's a winner" mentality. My two kids have dozens of trophies from sports. Not necessarily for winning, but just for participating. So the same thing appears to have happened here. And not just the pickled goods, just about every category and sub-category entry had a ribbon. It devalues real achievement in my opinion. This isn't the main midway, it's really behind the trees to the right. But I guess the area couldn't suport the larger rides. I do like the way the still try to separate the travelling rides/concessions from the local. So I could still get a burger from the Little Valley Volunteer Fire Department and a milkshake from the Napoli Methodist Church booths. That was my Mom's church. A travelling Lumberjack show, from the Adirondack Mtn. area of N.Y. It was entertaining but you could tell how routine the show had become for the three performers, two old, one young. The crowd enjoyed it. In the photo, the old-timer loses a log-rolling competition to the young "challenger." This is just pure Western N.Y. My sister says the residents are "redneck" by definition. I use the phrase "hillbilly." Both politically incorrect I'm sure. But you have to have lived there. 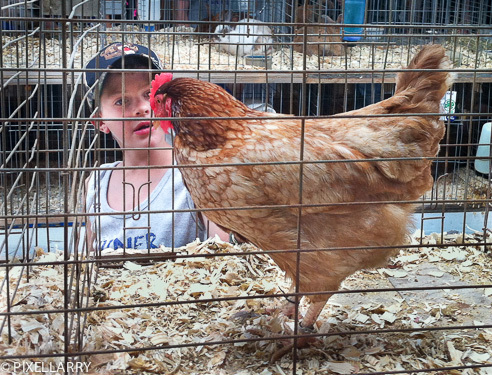 Yes, you can meet the livestock entries up close and personal. I don't know how you judge chickens, but the girl seemed to be looking for a connection. Red. A reminder that livestock entered in the Fair are not just a piece of meat. They are family. For you techies, Nikon D7000, Nikon 300mm f2.8 with a 1.4x converter. On-camera flash for fill.In my photography class, I make it a point to tell students that if your file isn't backed up in at least two places, it doesn't exist. I took the above photo the other night at my patio. It's a House Wren singing while perched on an old fan flash I have attached to a fence post. I'm working on an essay on my backyard, so I was very pleased to get this picture. So I opened it on my laptop from the SD card (without importing the contents of the card), sized it and sent it to a few people to get some feedback. The next morning I took the card and put it in my shirt pocket with the intention of taking it to the studio to save with similar photos. I also placed my iPhone, in a Speck case in the same pocket. I ran a few errands and when I got to the studio and reached for the card it was gone. Apparently the rubber edge of the phone case had grabbed it and pulled it out of my pocket at some point. D'oh! I retraced my steps but no luck. So if you find a 16GB SD card in Westlake or Bay Village, Ohio with the intitials LTK on it, I'd appreciate it's return. I can offer a framed 8x10 of the image or cash if returned. I don't expect that to happen, but I did learn a hard lesson. When I drew the line between "real" camera photos and my iPhone photos on this blog I didn't think the line would blur so quickly. Last weekend I was out puttering about in my manly yard duties when I saw a squirrel hustle up to a recent cut in a Maple tree. I didn't know that Red Squirrels found the sap very tasty. 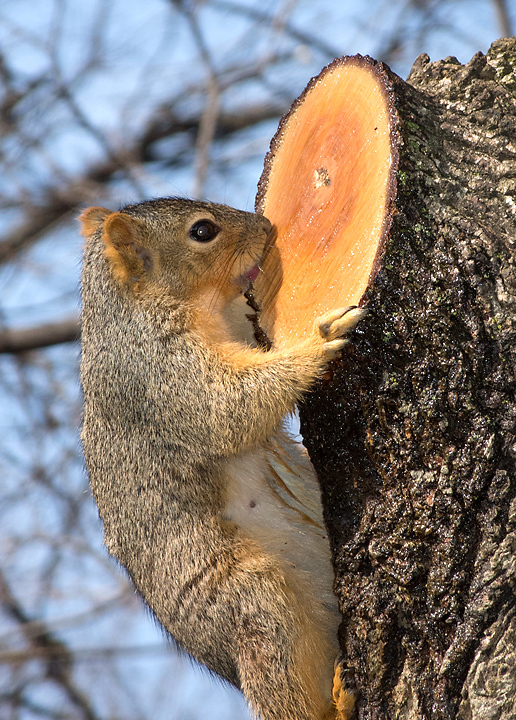 I learned that in my extensive Goog, err, research, it's not uncommon for them to cut the bark to feed on the sap. That also explains the various spots on my driveway. Personally, I found the sap tasteless. So here was a virtual fountain of sap provided unwittingly by me when I trimmed the maple earlier in the season. When I saw the squirrel the only camera equipment I had with me was my iPhone (4). So, I grabbed my cheap 8x power binoculars (always handy for birding) and tried to it steady on the phone while I braced against the garage and made a few frames. See photo above. The squirrel didn't seem to be stopping any time soon so I went inside and grabbed by Nikon P7700 and managed to sneak to within about 10 feet at 200mm. See photo below. So what's the difference? The tools, yes. The light, no. The time of day, not really. Focal length, OK, maybe an edge to the P7700. The only difference is that I found the iPhone photo to be more voyeuristic, primarily because of the hard vignetting on the image.